He wears leveled black mage robes, possibly hooded and/or enchanted, along with a pair of boots. He wields a leveled staff coupled with a possibly enchanted dagger that can be up to Daedric in quality, and carries random warlock items and two random copies of atronach forge recipes, one of which is written in the Daedric alphabet. He knows the spells Lesser Ward, Flames, Oakflesh, and Conjure Flame Atronach. He will run up to you excitedly, greeting you with "I've finally found you! I want to join the College of Winterhold. But I need help with my wards. Can you teach me?" If you decline, he will be disappointed: "Oh. All right... I guess I'll just keep practicing on my own. Sorry to bother you." He will then bid farewell. Accept and he will instead reply, "Really? Great! Okay. So, first, you raise your ward and I'll throw a little spell at it. That way I can see the 'right' way to do things." He will prepare his spell, telling you to "Get your ward ready." If you have not readied your ward, he will say, "Come on. I don't want to hit you until you have your ward ready." Once you've cast a ward, the student will tell you, "Great! Now I'm going to cast some spells at you. Keep your ward up so I can study it." as he casts a spell against your ward, usually Flames. He will say, "I think I see what I was doing wrong..." and talk to you again: "All right. That should do it. I think I'm ready to try the College again. Thanks! ", ending your conversation with him. His spell has a random combination of effects. Sometimes, when accepting the aspiring student's request, he will get stuck in a loop, attacking you with his spell continuously. A possible fix to this is to move around a little bit with your ward(s) up. Despite being able to view the items in the student's inventory, you cannot successfully pickpocket the items. The pickpocket attempt may seem successful; however, the items stolen will not appear in your inventory afterwards. ? 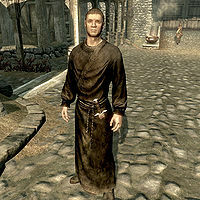 The student may get attacked by the guards and NPCs that you have helped upon attacking you if encountered in Whiterun and Riften.